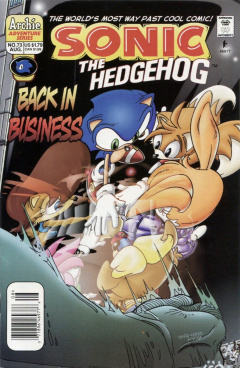 Sonic the Hedgehog 73 is the seventy-third issue of the Sonic the Hedgehog comic. This issue features two stories, the first story, titled "The Truth Is Out There", and the second, titled "Tales of The Gread War Part Two: The Big Bad One". Of note is that the second story takes place in continuity before the primary story. Sonic The Hedgehog presents a gift to his parents Jules and Bernadette Hedgehog: new anniversary wedding bands made from Power Rings. Nate Morgan, one of the creators, compliments his partner and student, Sonic's Uncle Chuck, on his work on the bands. Chuck is appreciative, but admits that he's uncomfortable with the fact that the creation of the Power Rings was credited to him exclusively when Nate originally conceived of them. Nate reveals that King Maximillian Acorn chose to take that course, rather than risk Nate being falsely branded a traitor, adding that Chuck's innovations have only helped advance Nate's original theories. Nate then bids his goodbye, while Sonic is then summoned to Castle Acorn by Sally. The princess herself, having just contacted the other Freedom Fighters, converses with Nicole, who questions why she chose not to inform Sally's father of their recent findings. Sally responds that she wants to be "one-hundred percent sure", just as her brother Elias walks in. Elias promptly questions what it is she wants to be so sure of. NICOLE suggests to Sally that she confide in Elias, but Sally hesitates, which Elias understands: The siblings have only recently met, and neither knew of the other's existence until a short time ago. He then reveals his hopes that they can have a strong relationship, particularly as the demands upon their father prevent him from having much personal time with them. Sally admits that her own life has been turned upside down since Elias' arrival, especially upon learning that he is to take the throne instead of her-only for Elias to confess that he has no desire to rule the Kingdom of Acorn. Meanwhile, in orbit around Mobius, Snively cowers on his knees to his mysterious abductor. Snively asks what he intends to do with the satellites, which prompts his captor to snap back "Wouldn't you care to be privy? So you could immediately set about doing me in? Oh, don't bother trying to deny the truth, you half-wit. I've already forgiven you, flawed as you are." The mystery man proceeds to activate the last remaining offline satellite, pressing a key: "I-Sat Unit back online. And commencing system location of target. Target locked-system locked-And beginning activation... NOW!" Back in Mobotropolis below, Sally reveals to the assembled Freedom Fighters that she and NICOLE have discovered the existence of the satellites, and are determined to identify them. While the satellites above begin to interlocking with one other in a R-O-B-O-T-N-I-K sequence, Sally explains the circumstances in which each was activated, and the Freedom Fighters begin to see links to recent events. These include the break out from Devil's Gulag, avalanches in the Southern Tundra preceding Sonic's battle with Ixis Naugus, a Robian attack at the Lost Temple of Shazamazon, and the recent meteor shower that struck Mobotropolis. Yet another satellite activated at the time of Snively's supposed demise, and Elias, included in the meeting, wonders if the villain's death may have been a ruse. The activation of two more satellites coincided with the time beam that nearly destroyed reality, and with the interference in King Acorn's Telecrate broadcast. Sally immediately resolves to inform her father, just as Max himself enters the meeting. Nicole updates her astronomics file, informing everyone that the final satellite has been activated. An aghast Sonic asks where the satellite was activated, and Nicole replies "Knothole Village". Hearing this, Sonic rushes home, only to find everyone, his parents, his uncle, his dog and all the Robians in residence, gone. Sonic despairs, while his sadness is watched and celebrated high above by... Dr. Robotnik. Tales of The Great War Part 2: The Big Bad One"
Back at the Mobotropolis Library, Tails and Amy Rose are reading another of Kirby works with Jeremiah when they are joined by an unexpected visitor: Sonic's Uncle Chuck. After recognizing that they're reading the account of the Great War, Chuck takes over, and recounts the falling out between Warlord Kodos and Ixis Naugus. Following their successful betrayal of Nate Morgan, Kodos attempted to destroy the wizard in order to secure his own rule, only for Naugus to escape with his magic. Deciding to leave Kodos to the war he had longed for, Naugus escaped into the Zone of Silence, but not without promising to return. Tails is impressed by Chuck's apparent firsthand knowledge of the story, to which Chuck reveals as a Robian, he downloaded this information from Robotnik's files, and learned secrets about Kodos that even Kirby didn't record. These include the murder of a pair of scouts-one Mobian, one Overlander-who hoped to prevent war by delivering false reports to their people. However, Kodos captured them and then framed each side for the murder of the other's messenger, helping kick off the Great War. The lead story's title is an homage to the iconic tagline of the '90s Sci-fi/horror television series "The X-Files", starring David Duchovny and Gillian Anderson.